Last year alone, CWU's Student Medical and Counseling Clinic documented 18,635 appointments. Of that total, 9,693 were for medical services, most typically for upper respiratory infections--such as chest colds, sinus problems, or sore throats--and mental health concerns. But, regardless of malady, students utilizing the clinic's services can know that their health care is in excellent hands. That's because, for the sixth consecutive time, Central's Student Medical Center has been accredited by the Accreditation Association for Ambulatory Health Care, Inc. (AAAHC). CWU is one of only two university healthcare facilities in the state, and the only one at a regional institution, to currently hold this accreditation. "This 'stamp of approval' by an outside agency that knows health care well, and how health care facilities should be run, means we were found to be providing great service," said an obviously pleased Rhonda McKinney, Student Medical and Counseling Clinic executive director, about the accreditation. "Because of that, our students can continue to be confident that they are well cared for here." The organization accredits more than 1,000 health care organizations, including university student health centers, worldwide, as well as health plans, such as health maintenance and preferred provider organizations. CWU's new, three-year accreditation-the maximum allowed-came following an extensive, on-site review of the clinic's facilities and services in January. "They go through it all with a fine-tooth comb: the physical structure-the inside and outside of the facility-our policies and procedures, our clinical records-everything," McKinney explained, while giving full credit to the medical facility's staff for the accreditation. "They stepped up to the challenge of making sure everything was pulled together in writing, in a single place, in an organized and coherent fashion. It had to allow someone from the outside to come in and go through it in two days, and get a really good sense of who we are, what we do, and how we do it." It was determined that CWU's medical services and performance fulfilled the series of rigorous, nationally recognized standards including in the areas of clinical records, environmental safety, governance and administration, patient's rights, quality of care, quality management and improvement. "The site visitor commended us on the positive nature and responsiveness of our team, our teamwork, and how it came together," McKinney pointed out. "She actually said that, if she went back to work full time, she would want to do it here. I thought that was a good compliment." 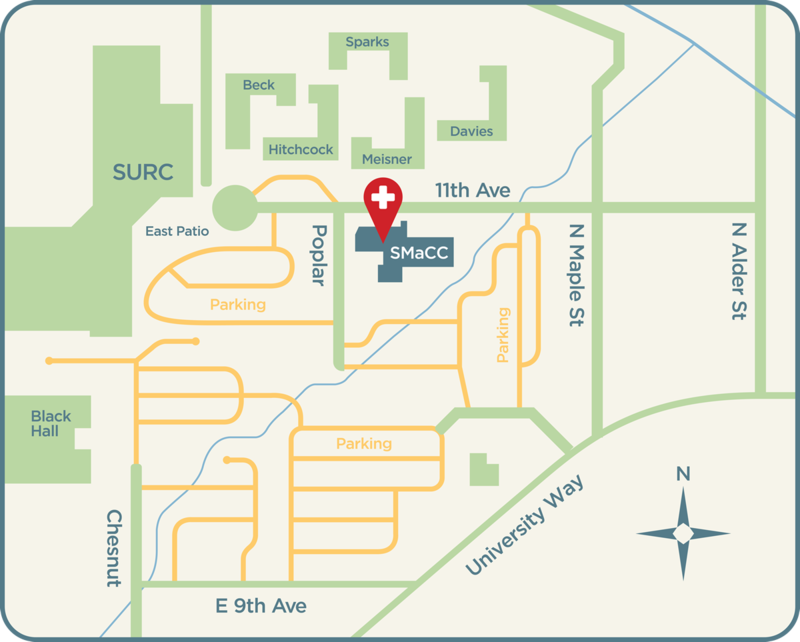 Open weekdays, CWU's Student Medical Clinic has 10 staff to handle medical appointments and drop-in visits, including three Advanced Practice Registered Nurses, who are licensed to diagnose illnesses and prescribe medication and treatment. The AAAHC accreditation pertains only to the clinic's medical services. But, because of the combined nature of the CWU facility, the reviewer went through some of the counseling clinic's clinical records, and posed questions about behavioral health at CWU and how medical and counseling collaborate. "That was another thing we were commended on-the cooperative way we work together-and how our students benefit from that," McKinney said. "The trend nationwide is to combine medical and counseling centers on college campuses, but that's not as easy a task as it may seem." CWU students taking six or more credits, pay a $91 quarterly fee ($60 for summer term) which fully funds university medical and counseling services.